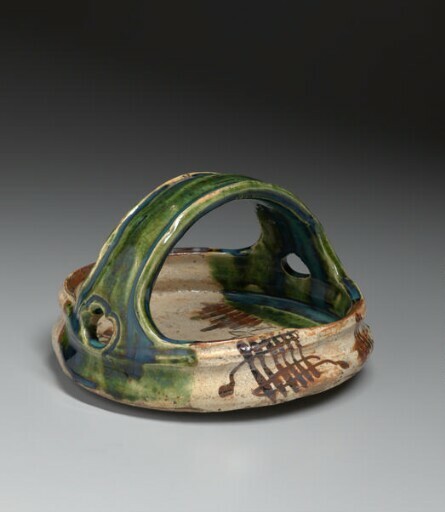 The name of Oribe ware derives from the tea-ceremony practitioner and warrior of the Momoyama period, Furuta Oribe (1544–1615), the most devoted student of Sen no Rikyu (1522–1591), one of the most famous tea-ceremony masters in Japan. Born in Mino, Oribe is believed to have guided production at some of the Mino kilns, near modern-day Nagoya city. Oribe favored bold, distorted shapes and imaginative new patterns in his teaware. Characteristically, the shapes combine geometric and curvilinear elements, and mechanical as well as organically derived features, richly decorated with white slip, brown paint, and green glaze. At their best, Oribe wares are among the most innovative tea utensils made during the Momoyama period. This irregularly shaped dish was used to serve sweets at a tea ceremony. It appears to have been started on a wheel and finished by hand to achieve the uneven shape. The contrast between the simple decoration of brown floral and geometric motifs and the eye-catching splash of bright green glaze over a finely crackled, cream-colored ground illustrates the special sense of design admired in Oribe wares. acquired by Kimbell Art Foundation, Fort Worth, gift of Mr. and Mrs. Randolph B. Caldwell, Dallas, 1983.